RootsMagic is pleased to sponsor RootsTech 2017, the largest genealogy conference in the world. You can read about several of the ways you’ll be able to interact with us at the conference and the GBA Colossal Giveaway where you can win some amazing prizes. 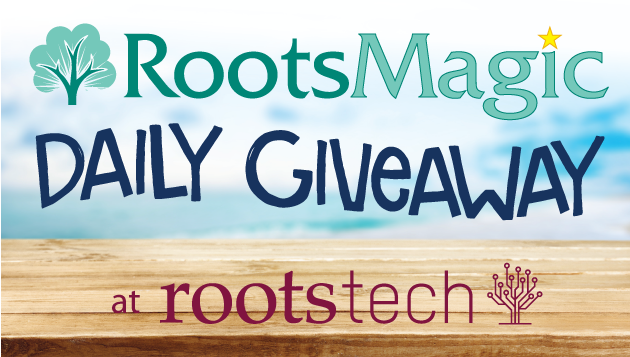 Today, we announce a second way to win prizes at RootsTech- the RootsMagic Daily Giveaway! 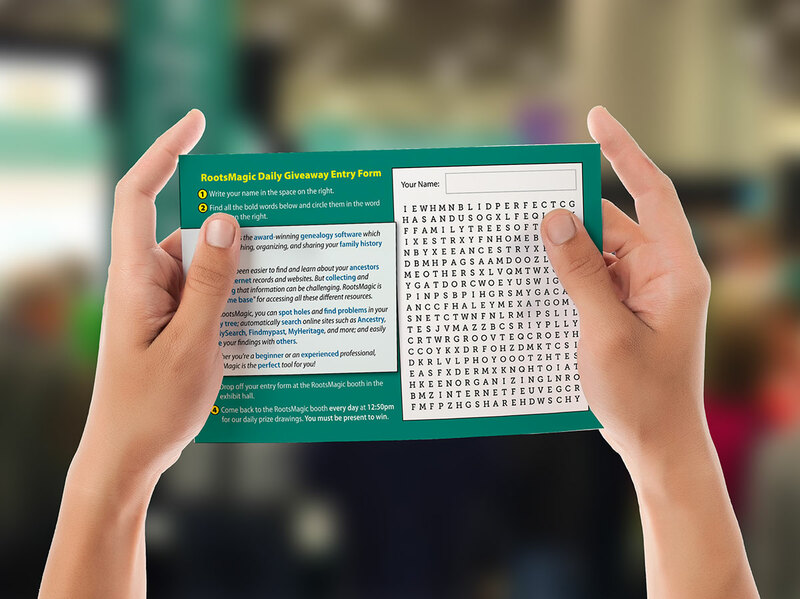 Find the RootsMagic Daily Giveaway Entry Form in your RootsTech attendee bag. Forms are also available at our booth. Complete the word search puzzle on the entry form. Don’t forget to write your name on it. 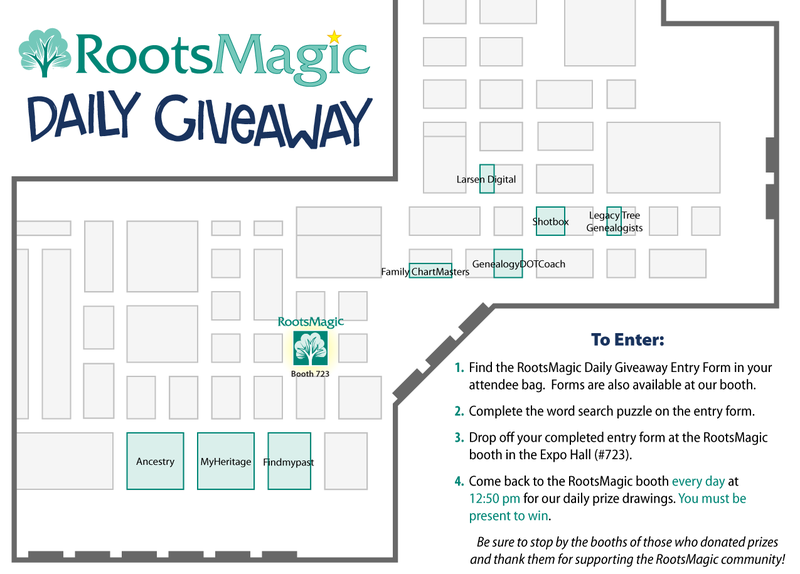 Come back to the RootsMagic booth every day at 12:50 pm for our daily prize drawings. You must be present to win. Be sure to stop by the booths of those who donated prizes and thank them for supporting the RootsMagic community! What about all the users who would love to be there but live on the other side of the planet? Unfortunately I will not be able to attend (much as I’d like to) – Getting to The States from UK is a big problem for me now I’m in my 90’s. However, my mind is still active, and I appreciate all the information that Bruce has given me over the years with RM. I shall watch with enthusiasm any comments others make who are lucky enough to be able to attend. Good Luck with the Conference, Bruce! By the way – how may we enter your Daily Prize Giveaways, if we cannot possibly get to you? I am so very excited to attend this conference. It is my first time, and I am like a child in a candy store. I plan to attend your class as well. Thank you!!! Is there a way we may enter the giveaway if we aren’t lucky enough to be at RootsTech? Roots Magic Software is so easy to use. I would recommend it . I can’t attend, but I am grateful for all that is on line. Please keep us updated on what will be on line. Thank you. Maybe we could have some of the prizes too. Thank you so much for the opportunity to win RootsMagic 7 for our family at RootsTech 2017. I installed it tonight and I’m looking forward to learning how to use it.